First hollow stem occurs just prior to jointing and is the optimal time to remove cattle from wheat pasture. 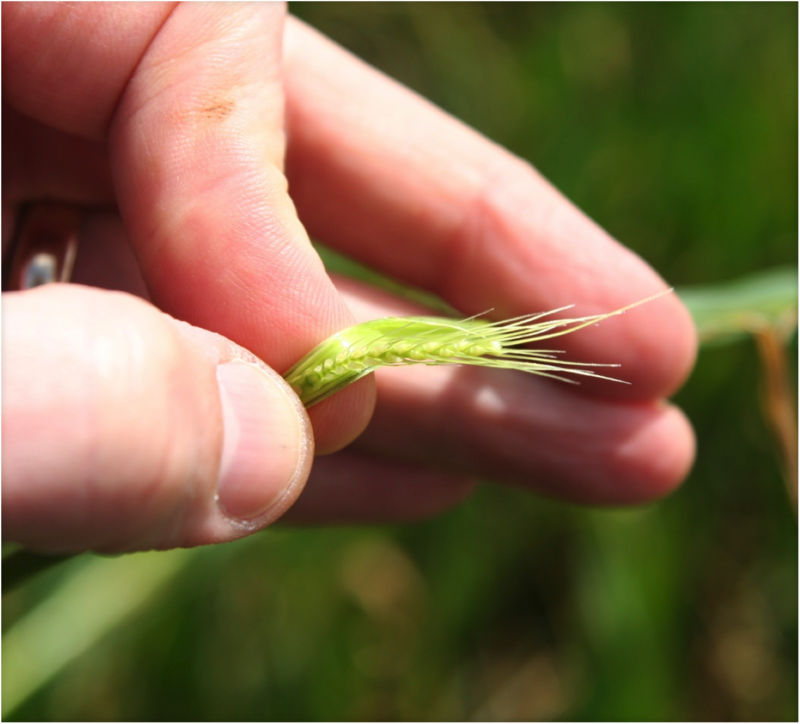 Given the warm forecast for the next two weeks, it is likely that we will start seeing first hollow stem in Oklahoma wheat fields. Grazing past first hollow stem can reduce wheat grain yield by as much as 5% per day and the added cattle gains are not enough to offset the value of the reduced wheat yield. 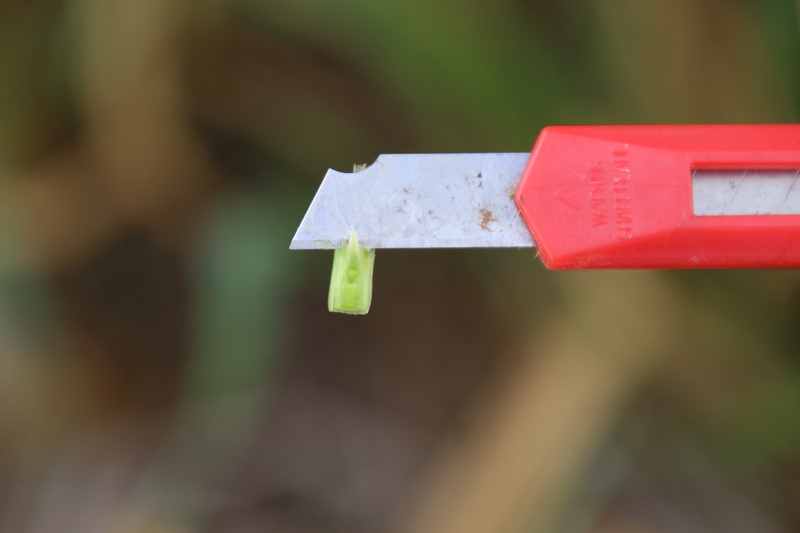 Similar to previous years, we will monitor occurrence of first hollow stem in our wheat plots at Stillwater and report the findings on this blog. There is also a first hollow stem advisor available on the Oklahoma Mesonet that can assist in determining when to start scouting. Checking for first hollow stem is fairly easy. 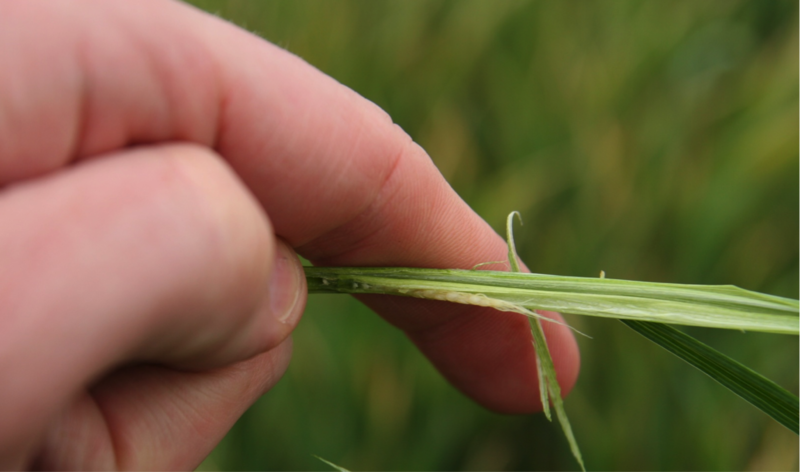 You must check first hollow stem in a nongrazed area of the same variety and planting date. Variety can affect date of first hollow stem by as much as three weeks and planting date can affect it even more. Dig or pull up a few plants and split the largest tiller longitudinally (lengthways) and measure the amount of hollow stem present below the developing grain head. You must dig plants because at this stage the developing grain head may still be below the soil surface. 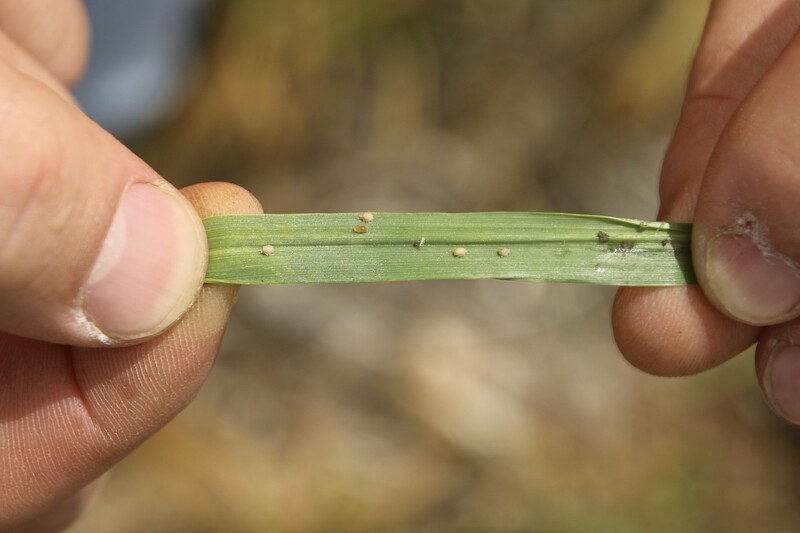 If there is 1.5 cm of hollow stem present (see picture below), it is time to remove cattle. 1.5 cm is about the same as the diameter of a dime. Is this the year for split fungicide application? February 9, 2016 10:58 pm / 1 Comment on Is this the year for split fungicide application? When to apply – The first pass in a two-pass fungicide system should be applied just after jointing. Please note that this is well after topdress nitrogen should be applied. For this and other reasons (see Dr. Arnall’s blog), tank mixing fungicides with nitrogen is generally not a good practice. Remember that the purpose of the early fungicide application is to keep disease in check until you come back with a flag leaf application in April. Going too early can result in too large of a gap between applications and enough time for disease to re-establish. Going too late can reduce the return on investment. Timing is everything with fungicides. 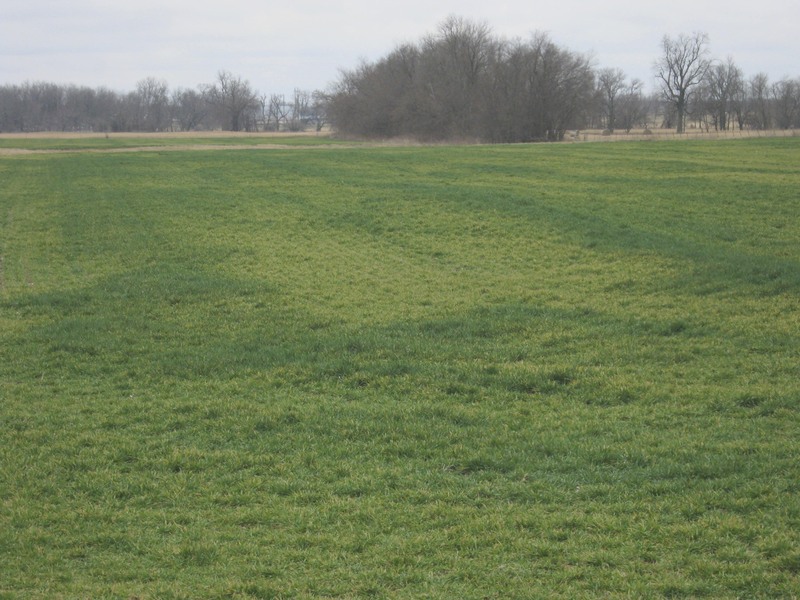 How much to apply – Back in the day, the discussion around split fungicide application centered on half rates for the first application. This recommendation was because of cost savings rather than disease management. The availability of low-cost, generic fungicides, though, has changed our philosophy, and a full rate of a low cost fungicide is the standard for split applications. Which product to choose – Product choice is at the discretion of the consumer. If you are considering how to best spend your season-long fungicide budget, however, I would strongly recommend saving your “best” and perhaps most expensive product for the flag leaf application. Watch season-long restrictions – As always, please read labels carefully and make note of season-long application restrictions. You don’t want an early fungicide application to remove the ability to apply your preferred product at flag leaf. 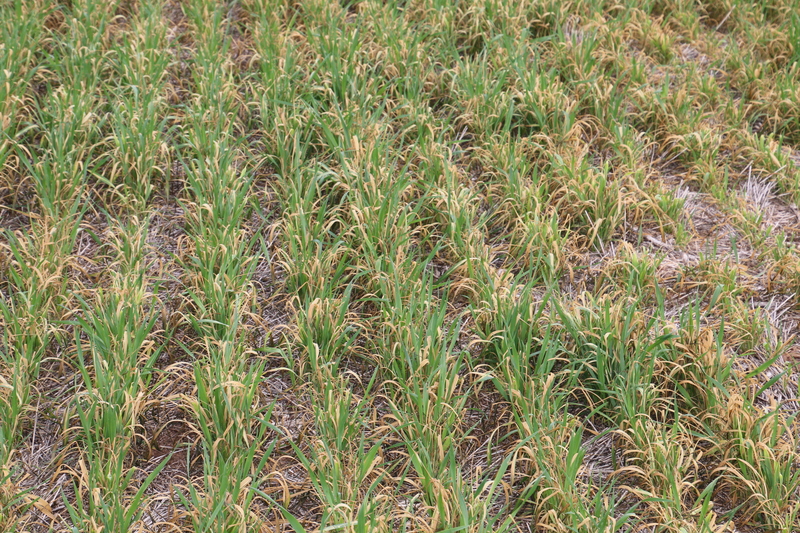 This overhead shot of the 2015 Chickasha intensive and standard wheat variety trials illustrates the severity of stripe rust in the region. The intensively managed trials on the left was treated with a fungicide just prior to heading. The standard trial on the right has the exact same varieties but no fungicide. The “middle” replication between the two studies is a border of Ruby Lee that is 1/2 treated 1/2 non treated. Stories about seed law violations and fines have sprung up occasionally in the farm press over the past few years. These stories have tended to focus on the “penalty” part of the law and the magnitude of the fines rather than how the law protects Oklahoma farmers’ investments in wheat variety development and the provisions in the law that allow farmers to save seed for replanting. The purpose of this article is to answer some of the most frequently asked questions regarding the PVP law. The Plant Variety Protection Act (PVP or PVPA) is a federal seed law designed to protect the intellectual property of plant breeders, seed producers, and those who have funded variety development (in our case OSU and Oklahoma Taxpayers). The PVP law that you read about in the news today was enacted in 1994 and was an amendment to a law originally passed in 1970. The law prohibits the sale of farmer-saved seed without the variety owner’s permission. This protection lasts for 20 years for most crops. The ‘Title V’ you sometimes see tacked on to the end of PVP, refers to an amendment to the federal seed act stating that the variety can only be sold as a class of certified seed and by variety name. Can I save seed from PVP-protected varieties? Yes. You can save seed from PVP-protected varieties to plant on land you own or rent. You just cannot sell or trade the seed for planting purposes. A comparable example is an audio cd. You can make extra copies of an audio cd for your own use, such as an extra copy for the truck, without creating any problems. However, if you placed copies of the latest Sturgill Simpson cd for sale on Ebay, you would likely be contacted by the owners of the music regarding your unauthorized sale of their intellectual property. Can I save seed of Clearfield varieties? No, because Clearfield varieties are protected by a utility patent which protects a specific gene within the cultivar. Other examples of crop seed with genes protected by a utility patent include Roundup Ready, Bollgard, and Liberty Link. Wheat farmers will likely be seeing greater use of utility patents in the future but to my knowledge Clearfield varieties are the only hard wheat cultivars currently protected by a utility patent. What about selling variety not stated (VNS) seed? Not allowed. As indicated earlier, Title V of the federal seed act states that PVP-protected varieties can only be sold by variety name as a certified class of seed. This is one of several “ways-around-the-law” type questions that I am frequently asked at meetings and the answer is almost always no, you cannot do that. Other examples of violations would include: selling feed wheat, trading seed, giving seed away, and selling the standing crop of a PVP-protected variety and saving the seed. The law just applies to the seller, right? No. If there is a violation, then all parties involved can be included in the lawsuit. This includes the buyer, seller, seed conditioners, and even the entity spreading/planting the seed for the farmer. Certified seed of a protected variety will be clearly marked as such on the seed tag or the bulk label. 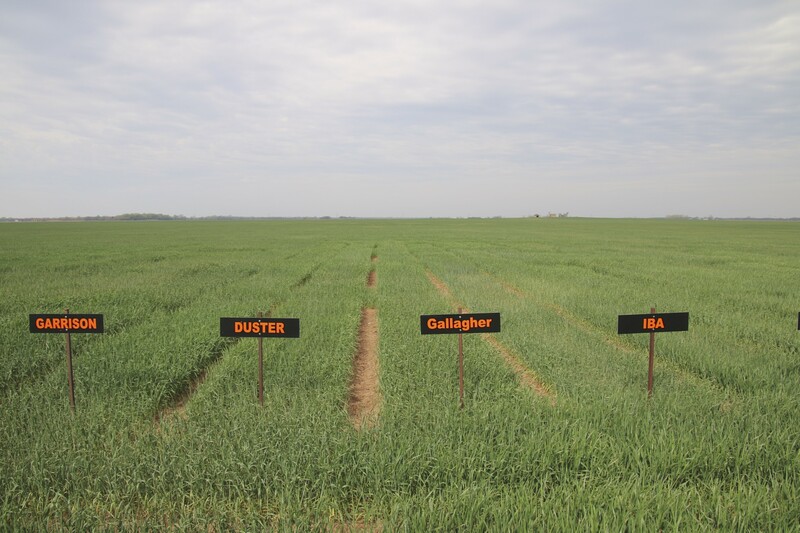 The OSU Wheat Variety Comparison Chart indicates which varieties are PVP-protected and can be found at www.wheat.okstate.edu under Variety Testing, then under Variety Characteristics. Most varieties are now PVP-protected. OSU is a public institution, why are they PVP-protecting varieties? First and foremost, OSU acquires PVP-protection for new wheat cultivars to protect our (OSU, farmers, and taxpayers) collective investment in variety development. It takes 10 – 15 years to develop a wheat variety and this is not a cheap process. Without PVP protection others could reproduce an OSU wheat variety and profit from its sale without any benefit returned to farmers or OSU. PVP-protection ensures that when you buy an OSU variety, you are getting exactly the variety you are paying for and OSU has ensured quality-control standards through the certification process. It also ensures that a portion of the purchase price is returned to OSU for re-investment in the wheat breeding program where it is used to develop well-adapted varieties and ensure that the public sector remains competitive in wheat variety development. I am an agronomist, not a lawyer, so this article was meant to only hit the high points. A complete copy of the law (45 pages) can be found with a Google search of ‘plant variety protection act’. Texas AgriLife Extension also has a good summary of the law that can be found with a Google search for ‘plant variety protection act TAMU’. 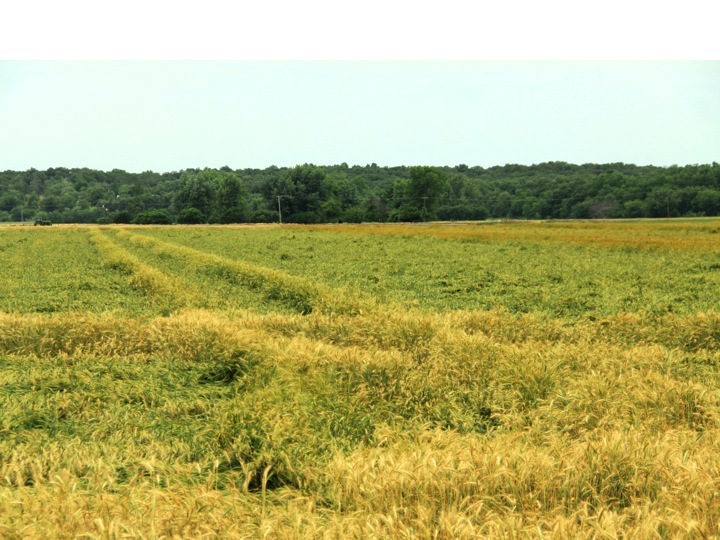 Wheat lodging is not generally a widespread problem in Oklahoma, but it does occur. Lodging occurs due to a variety of factors, and as shown in the figure below, the timing of lodging will determine the final impact on grain yield. 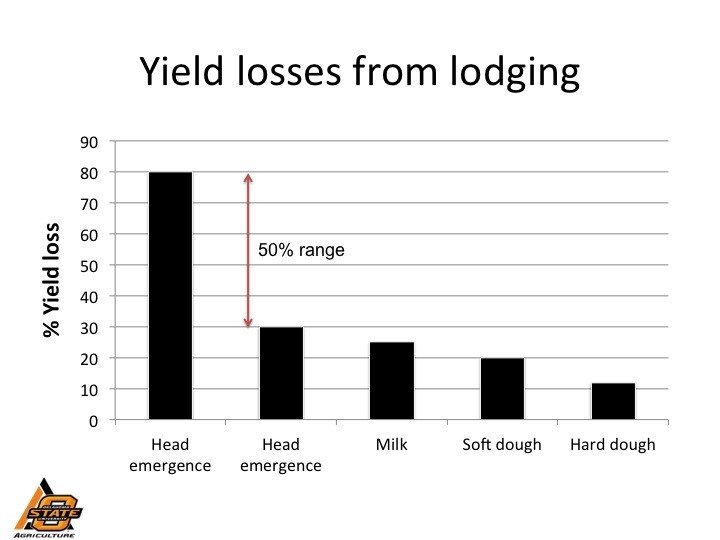 Lodging at head emergence, for example, can cause as little as 30 or as much as 80% yield reduction. The numbers in the figure do not account for harvest losses, which can exceed losses associated with lower photosynthetic capacity shown in the figure. 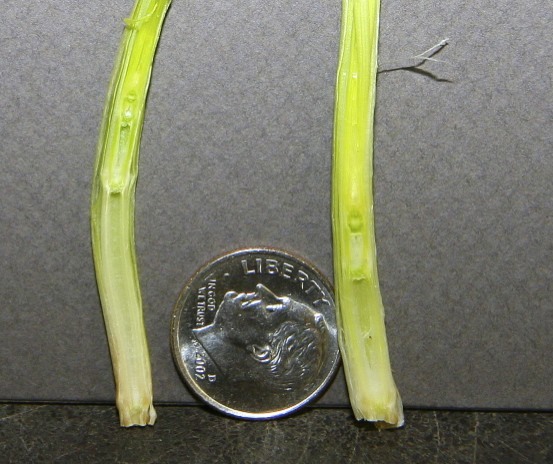 Freeze injury or disease can cause lodging due to stem failure, which is characterized by plant stems breaking near the base. I the absence of weakened stems due to freeze or disease, most lodging in wheat is caused by failure of the root anchorage system (root lodging). Root lodging occurs when the anchorage system of a top-heavy wheat plant is weakened due to moist soil and wind provides sufficient force to overcome the rotational stiffness of the root/soil complex. Research has shown that increasing the soil water content from 17 to 26% reduced the force required for anchorage failure by 33%, and as little as 0.25 inches of water plus 11 mph winds were enough to cause lodging. The thicker the wheat crop and/or the taller the wheat crop, the more force that winds exert on the root anchorage system and the greater the likelihood of lodging. In 2013 and 2014 we evaluated the plant growth regulator trinexapac-ethyl, which is sold under the trade name Palisade®. Palisade is a giberellic acid inhibitor and works primarily by reducing plant height. In our study we evaluated 12 oz/ac of Palisade with and without 4 oz/ac of Tilt (propiconazole) applied at Feekes GS 7 (two nodes visible above the soil surface). We included an untreated check and ALL plots, including the check, received 10.5 oz/ac of Quilt Xcel at Feekes GS 10.5 (heading). 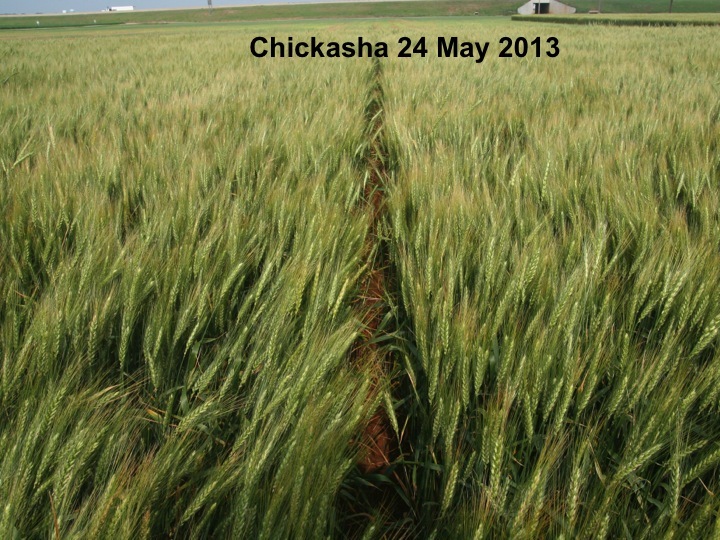 We conducted the trial at Stillwater (Irr), Perkins (Irr), and Chickasha (Non-Irr). I provided 2013 results in a blog post last year, and this post provides an update including our 2014 findings. 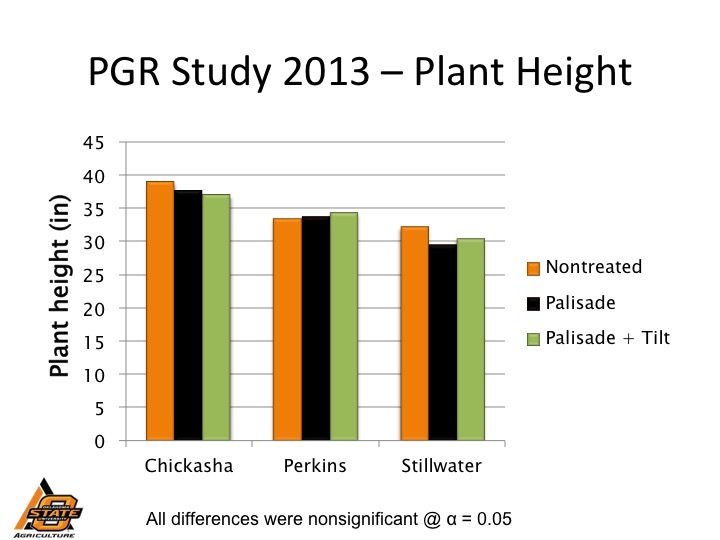 While application of Palisade resulted in numeric reductions in plant height at Chickasha and Stillwater in 2013, differences among treatments were not statistically significant. 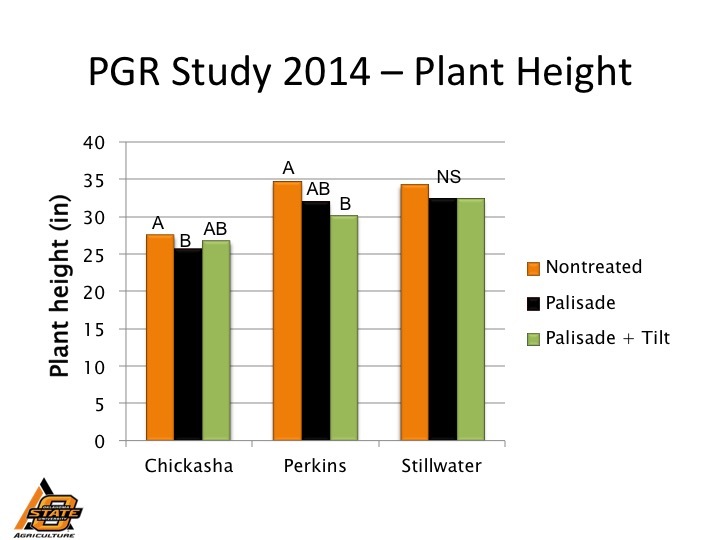 In 2014 application of Palisade or Palisade plus Tilt significantly reduced plant height at Chickasha and Perkins. We rated plots for lodging at harvest using a 1 – 10 scale with 0 equaling no lodging and 10 equaling complete lodging. Application of Palisade plus Tilt reduced lodging over Palisade alone at Chickasha. Application of Palidsade or Palisade plus Tilt resulted in numeric reductions in lodging scores at Stillwater in 2013, but the result were too variable to result in statistical significance. Palisade did not affect lodging at Perkins in 2013. There was no lodging for any site or treatment in 2014. Lodging as affected by plant growth regulator in 2013. No lodging occurred in 2014 regardless of treatment. 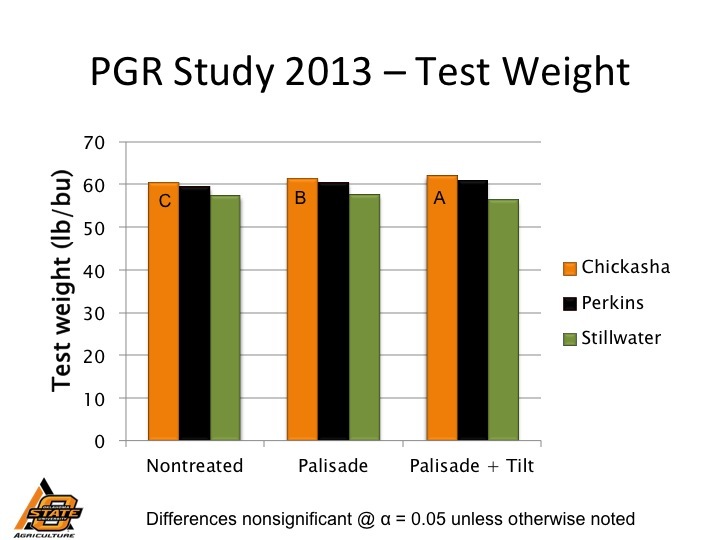 Application of Palisade or Palisade plus Tilt increased grain yield at Chickasha and had no effect on grain yield at Stillwater or Perkins in 2013. 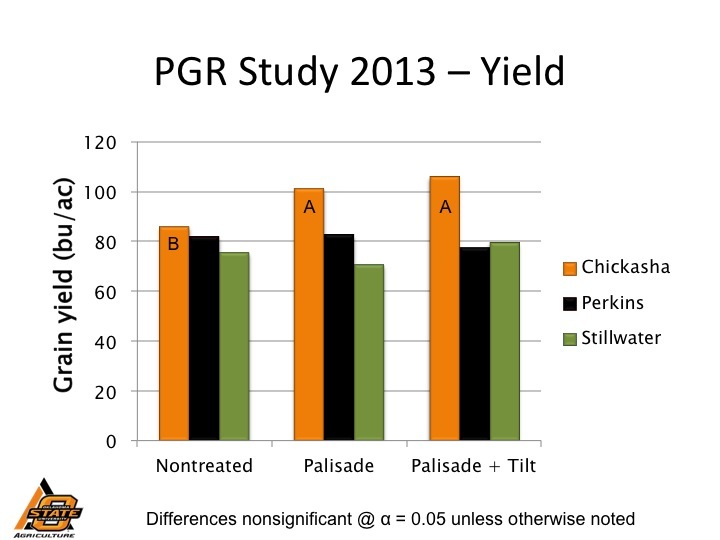 It is interesting to note that the Palisade treatment increased grain yield at Perkins in 2013 even though the plots lodged at comparable levels as the non treated check. My best hypothesis is that the treated plots lodged later than the non treated plots, as all plots were standing at anthesis (see picture below). Application of Palisade or Palisade plus Tilt increased grain yield at Perkins in 2014 even though there was no lodging. There were no differences in grain yield at Stillwater or Chickasha in 2014. To summarize our work, we found a trend for one to two inch reductions in plant height when Palisade or Palisade plus Tilt were applied, but this did not consistently translate to increased grain yield. Our results are consistent with other wheat plant growth regulator research, which has reported similar variation in response among sites and years. The literature also shows that reduction in lodging is relative to the straw strength of the variety. That is, a plant growth regulator will not make a lodging prone variety stand like one with excellent straw strength, rather they will make it less prone to lodging relative to the same variety non treated. Based on current evidence, plant growth regulators in Oklahoma are best kept on acres with high (> 80 bu/ac) yield potential that may have greater propensity for lodging due to variety or fertility. If these high yield potential acres are being sprayed with a growth regulator at GS 7, the addition of a foliar fungicide might be prudent if it can be included at a relatively low cost. This early-season fungicide application will not, however, substitute for a fungicide application at flag leaf. Full disclosure: Syngenta donated the product for this trial, but the only funding for the research was provided by the Oklahoma Agricultural Experiment Station and the Oklahoma Cooperative Extension Service. We conducted a separate trial evaluating Palisade in drought stress environments that was partially funded by Syngenta. The analysis and recommendations made in this blog post are based on research findings from 2013 and 2014 production years. Recommendations may change as further research is conducted and new information is obtained. First hollow stem occurs just prior to jointing and is the optimal time to remove cattle from wheat pasture. 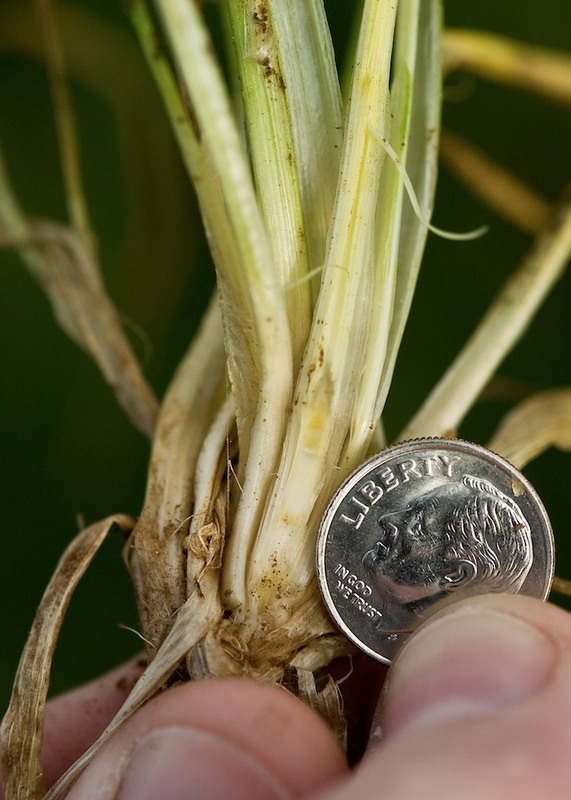 First hollow stem usually occurs in mid to late February in southern Oklahoma and early March in northern Oklahoma. Grazing past first hollow stem can reduce wheat grain yield by as much as 5% per day and the added cattle gains are not enough to offset the value of the reduced wheat yield. 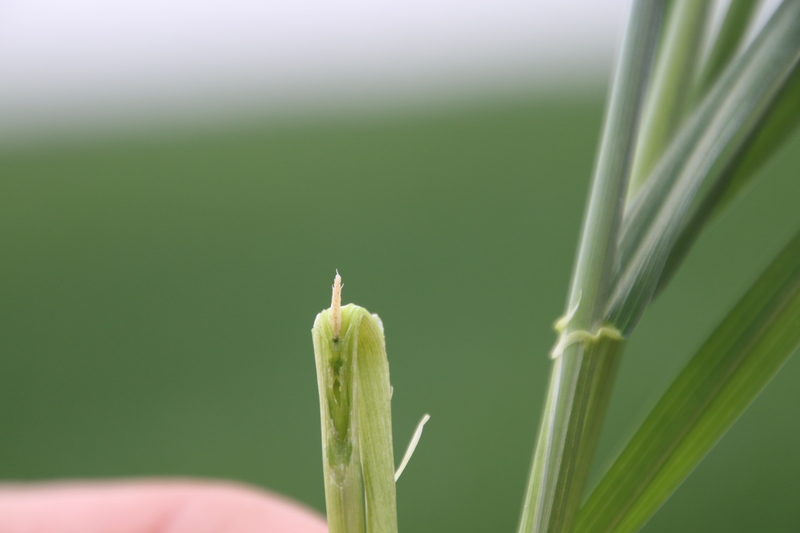 Similar to previous years, we will monitor occurrence of first hollow stem in our wheat plots at Stillwater and report the findings on this blog. There is also a new first hollow stem advisor available on the Oklahoma Mesonet that can assist in determining when to start scouting. 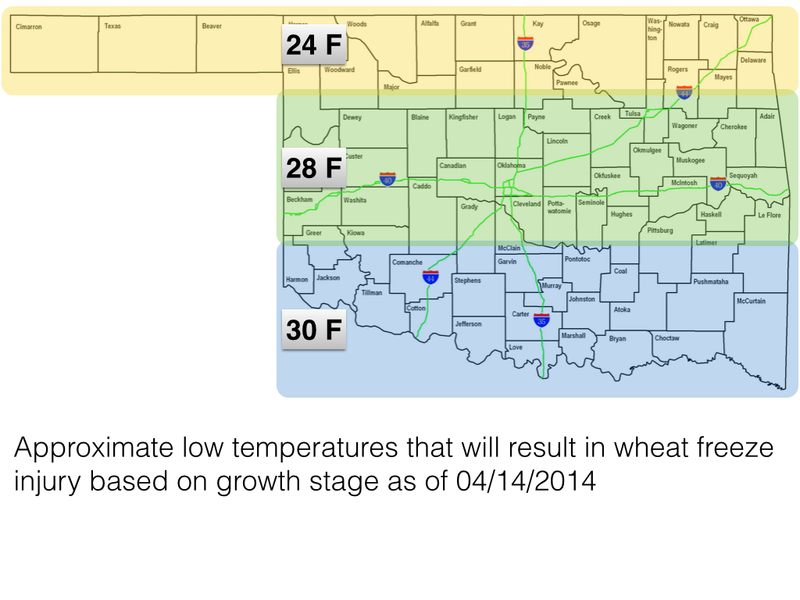 Temperatures are predicted to drop well below freezing tonight (14 April 2014), and there is high potential for freeze injury to Oklahoma wheat. 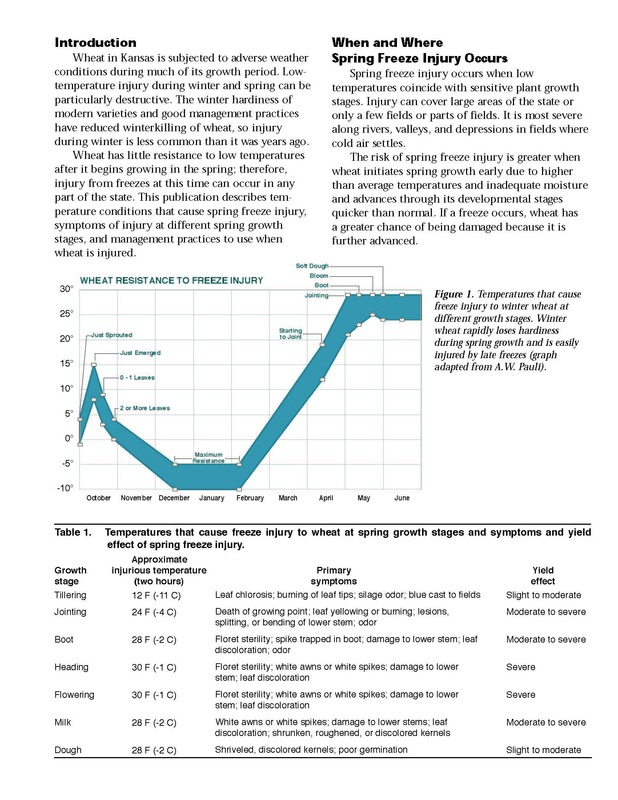 I have posted an excerpt from K-State Extension Publication C-646 Spring Freeze Injury to Kansas Wheat along with a map which provides some rule of thumb temperature thresholds for the current Oklahoma wheat crop. Keep in mind these temperature thresholds are not exact, and temperatures closer to the soil surface might be higher than those reported by weather stations one meter above the soil surface, especially if moisture is present. Wheat in Oklahoma ranges from just past jointing to late boot and if forecasts are correct we will drop below the threshold temperatures where injury might be observed. The extent of injury will depend on how cold we get and how long we stay there. We can lose a few main tillers at this stage and still recover. Given our limited moisture and limited time prior to harvest, though, it is not likely that we will recover from a complete loss of tillers as we have after some March freezes in the past. The photo below is from our wheat variety trial at Kildare. As you can see there is significant yellowing in some of the plots. Our first thoughts were that either wheat soilborne mosaic virus and/or wheat spindle streak mosaic virus were causing the symptoms; however, the yellowing was present in many varieties that are resistant to both these diseases. 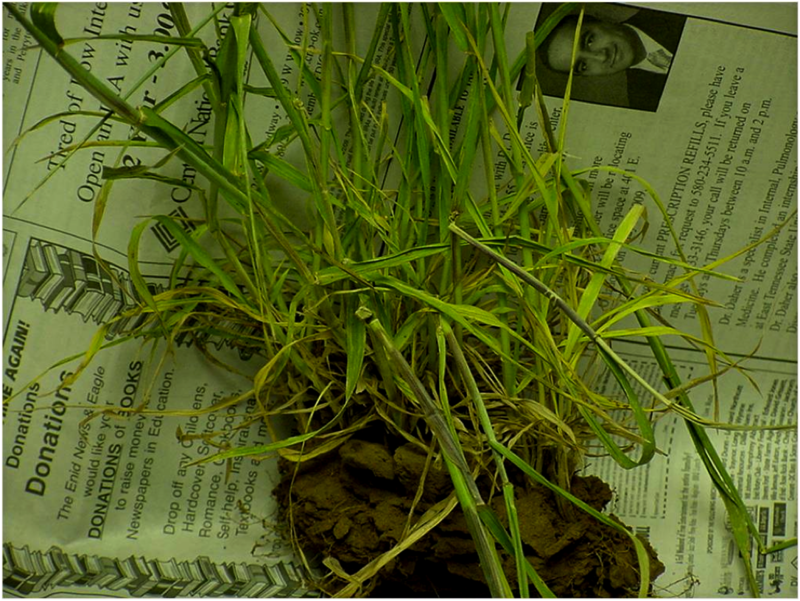 The Disease Doctor, Bob Hunger, collected samples for analysis in the OSU Plant Diagnostic Lab. 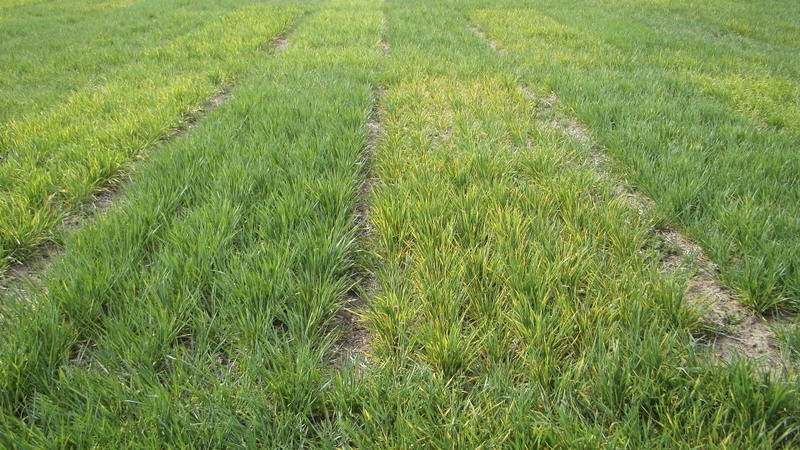 Tests showed that wheat streak mosaic was the culprit. 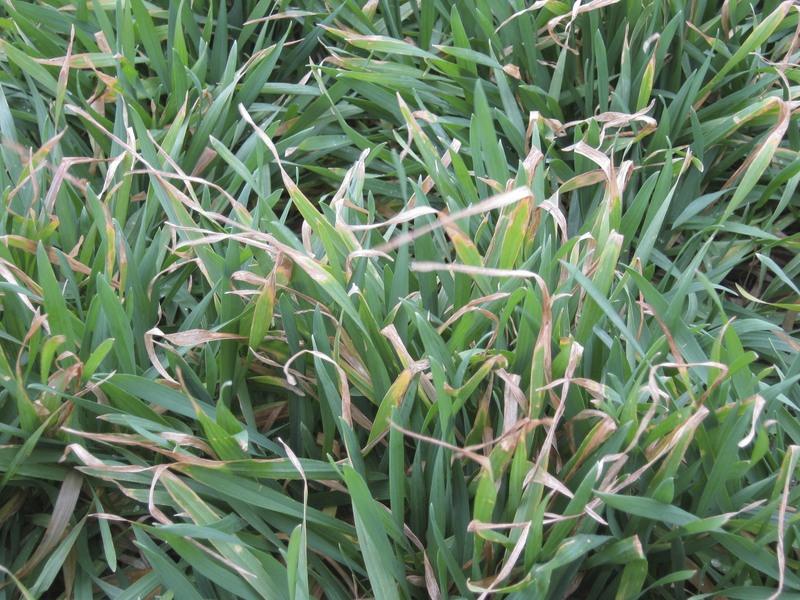 Wheat streak mosaic virus is responsible for yellowing at our Kildare variety trial. All varieties are affected by the disease, but as shown in this picture the severity of the reaction differs somewhat by variety. We are facing this problem because I did not follow my own recommendations. While the plot area was mostly clean at the time of planting, there was some volunteer wheat present. We planted anyway and sprayed glyphosate right after planting. In the past wheat streak mosaic virus was primarily a northwestern Oklahoma issue and we could get by with late burndown on wheat ground in central Oklahoma. Our Kildare plots are a prime example that this is no longer the case. 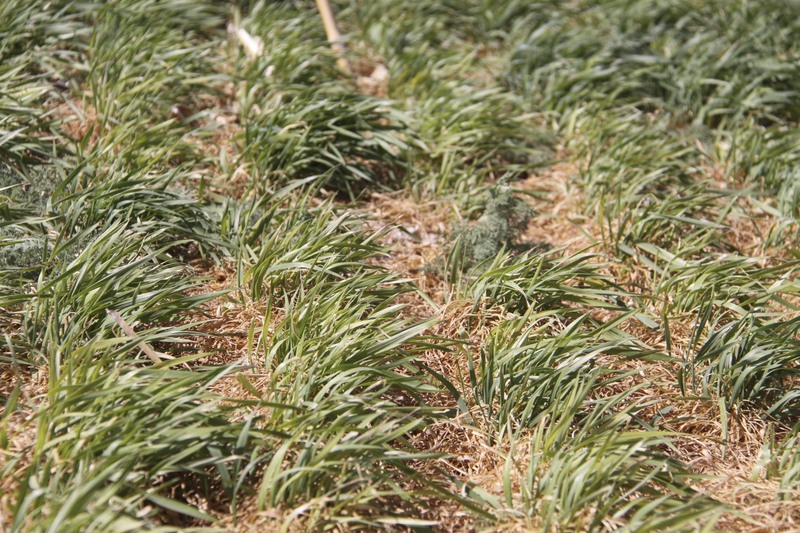 We have to control volunteer grasses (wheat, corn, grain sorghum, etc.) in a manner that will break the green bridge for at least two weeks prior to planting. So, what is next for our plots at Kildare? There are some variety differences in reaction to the wheat streak mosaic virus. We will rate plots and include this information in our wheat variety comparison chart. I anticipate the plots will continue to go downhill and it is yet to be determined whether or not we will be able to harvest useable data from the location. We will certainly try again next year and apply our turndown earlier. Many Oklahoma wheat farmers battled lodged wheat in 2013 and are looking to plant growth regulators to help reduce lodging in 2014. Lodging occurs due to a variety of factors, and as shown in the figure below, the timing of lodging will determine the final impact on grain yield. 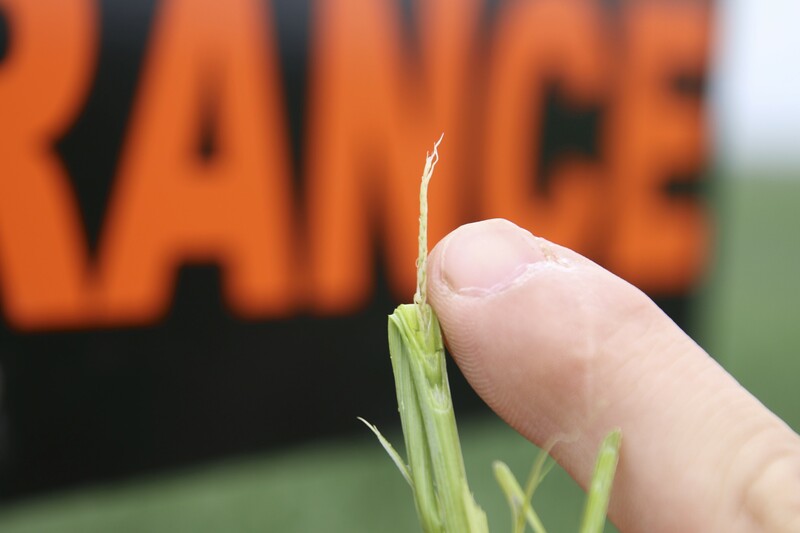 Lodging at head emergence can cause as little as 30 or as much as 80% yield reduction. The numbers in the figure do not account for harvest losses, which can exceed losses associated with lower photosynthetic capacity shown in the figure. 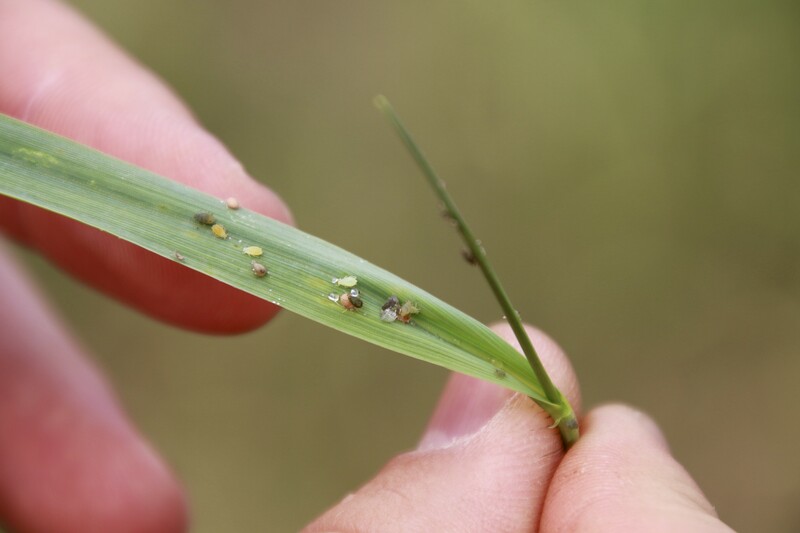 In 2013 we evaluated the plant growth regulator trinexapac-ethyl, which is sold under the trade name Palisade®. Palisade is a giberellic acid inhibitor and works primarily by reducing plant height. In our study we evaluated 12 oz/ac of Palisade with and without 4 oz/ac of Tilt (propiconazole) applied at Feekes GS 7 (two nodes visible above the soil surface). We included an untreated check and ALL plots, including the check, received 10.5 oz/ac of Quilt Xcel at Feekes GS 10.5 (heading). We conducted the trial at Stillwater (Irr), Perkins (Irr), and Chickasha (Non-Irr). 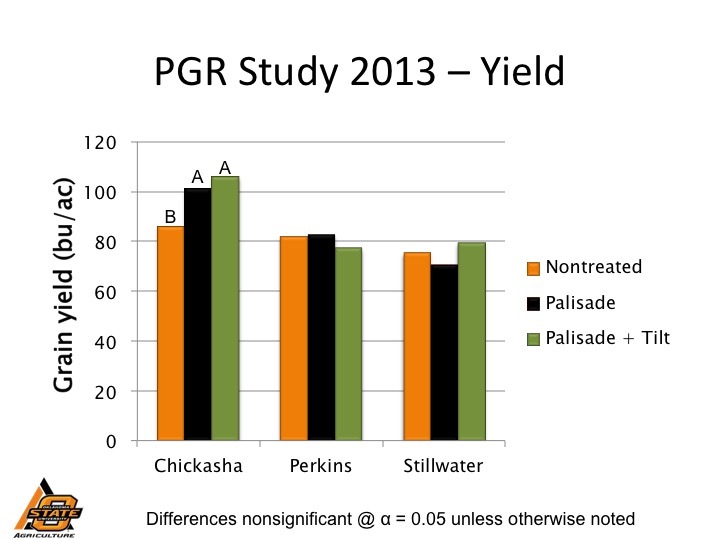 While application of Palisade resulted in numeric reductions in plant height at Chickasha and Stillwater, differences among treatments were not statistically significant. We rated plots for lodging at harvest using a 1 – 10 scale with 0 equaling no lodging and 10 equaling complete lodging. Application of Palisade plus Tilt reduced lodging over Palisade alone at Chickasha. Application of Palidsade or Palisade plus Tilt resulted in numeric reductions in lodging scores at Stillwater, but the result were too variable to result in statistical significance. Palisade did not affect lodging at Perkins. 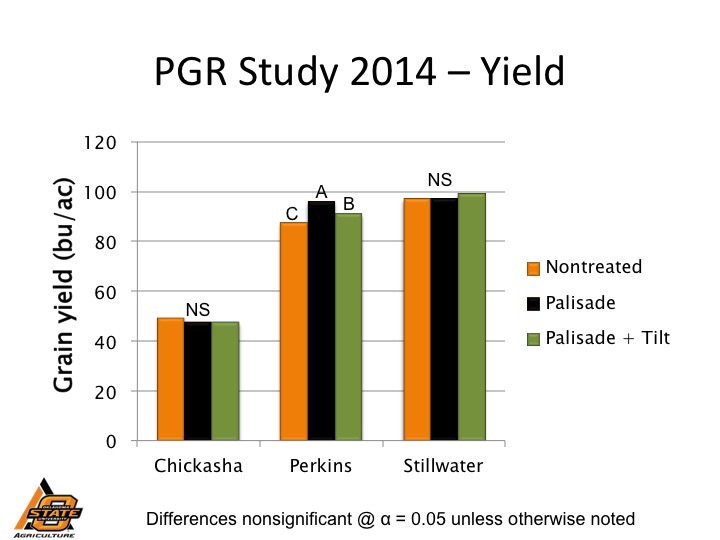 Application of Palisade or Palisade plus Tilt increased grain yield at Chickasha and had no effect on grain yield at Stillwater or Perkins. It is interesting to note that the Palisade treatment increased grain yield at Perkins even though the plots lodged at comparable levels as the non treated check. My best hypothesis is that the treated plots lodged later than the non treated plots, as all plots were standing at anthesis (see picture below). To summarize this first year of work with plant growth regulators, we found a trend for one to two inch reductions in plant height when Palisade or Palisade plus Tilt were applied, but this only translated to increased grain yield at one site. Our results are consistent with other wheat plant growth regulator research, which has reported similar variation in response among sites and years. The literature also shows that reduction in lodging is relative to the straw strength of the variety. That is, a plant growth regulator will not make a lodging prone variety stand like one with excellent straw strength, rather they will make it less prone to lodging relative to the same variety non treated. Full disclosure: Syngenta donated the product for this trial, but the only funding for the research was provided by the Oklahoma Agricultural Experiment Station and the Oklahoma Cooperative Extension Service. We are conducting the same trial in 2014 along with a separate trial evaluating Palisade in drought stress environments that is partially funded by Syngenta. The analysis and recommendations made in this blog post are preliminary and based on research findings from 2013. Recommendations may change as further research is conducted and new information is obtained. 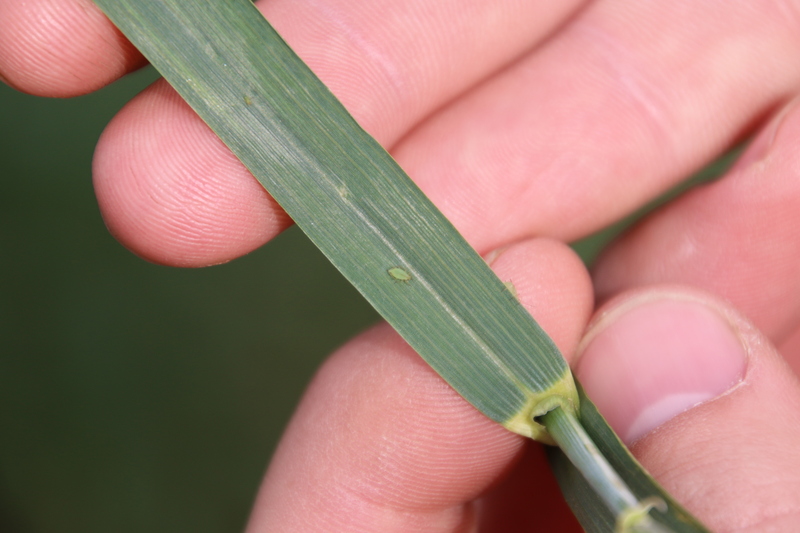 First hollow stem occurs just prior to jointing and is the optimal time to remove cattle from wheat pasture. 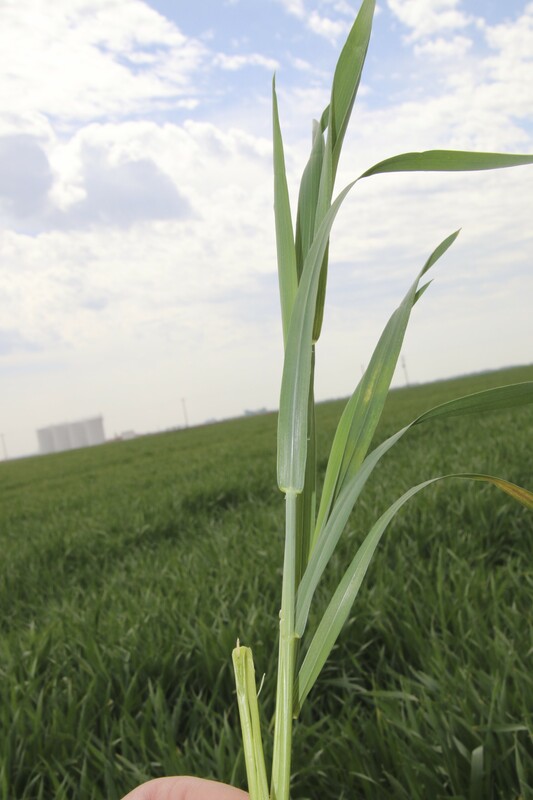 A new first hollow stem advisor tool available on the Oklahoma Mesonet provides Oklahoma wheat farmers a real time assessment of the current first hollow stem situation in the state and a forecast for the next two weeks. While the first hollow stem advisor is a valuable tool, it is not a substitute for scouting, as conditions in your field may vary from the estimates provided. The advisor uses a mathematical model that predicts the probability of first hollow stem based on soil heat units and wheat first hollow stem category (early, middle, or late). The model was developed by J.D. Carlson at OSU using first hollow stem data from the wheat variety testing program, and model development was made possible through a grant from the Oklahoma Wheat Commission. You can navigate to the first hollow stem advisor from www.mesonet.org by clicking on “Agriculture” then “Crop-Wheat” and looking for First Hollow Stem Advisor on the lefthand menubar. Or you can click here. Once you are at the first hollow stem advisor page, you will need to make a few selections. First, you have an option of viewing a statewide map or you can view data for a particular site in a table or graph. Next, you can select whether you want to view the current situation or a projection for the next one or two weeks. Finally, you will need to indicate if your variety falls into the early, middle, or late category. Click on the “look up by category” link if you are unsure where your variety falls. Above is the statewide map for current conditions as of 14 February 2014. Other than a hot spot near Ardmore, there is less than 5% probability that we are at first hollow stem in Oklahoma. Note, however, that many locations are near the 576 heat unit threshold for 5% probability of first hollow stem. This is where the projection tools come in handy. The map above is the two-week first hollow stem projection through 28 February 2014 (i.e the map was created on 14 February 2014). These projections are based on historical weather data for the next two weeks, and do not take into account the current forecast which might be warmer or colder than the historical average. Note that almost the entire state up to I-40 is predicted be at or above the 25% probability level for first hollow stem by February 28. It is recommended that you start scouting once the advisor predicts a 5% probability of first hollow stem in your area. If you are going by the first hollow stem advisor alone (not recommended) cattle should be removed no later than when a 50% probability of first hollow stem has occurred.